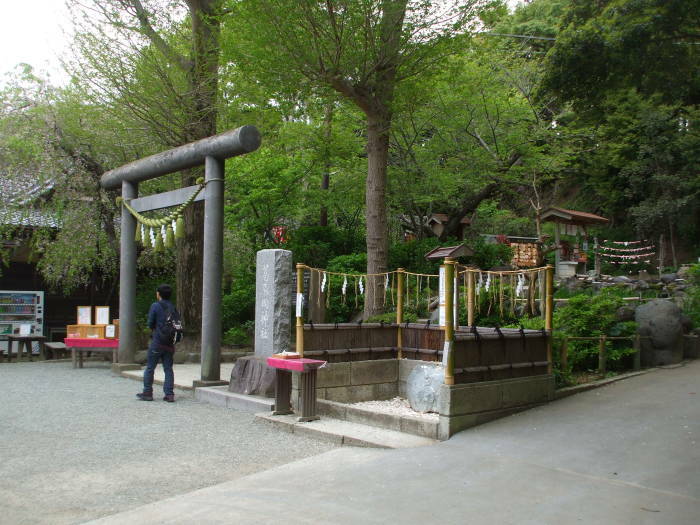 The Hachiman-gū shrine and Kenchō-ji temple are symbols of Kamakura. 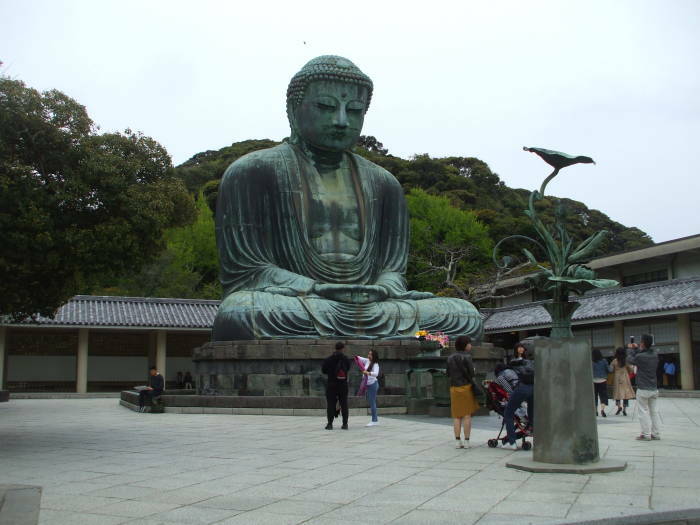 Daibutsu, the Great Buddha of Kamakura, is a symbol of all of Japan. It's a bronze statue seated outdoors at the Kōtoku-in temple. It stands over 13 meters tall and weighs about 120 tonnes. 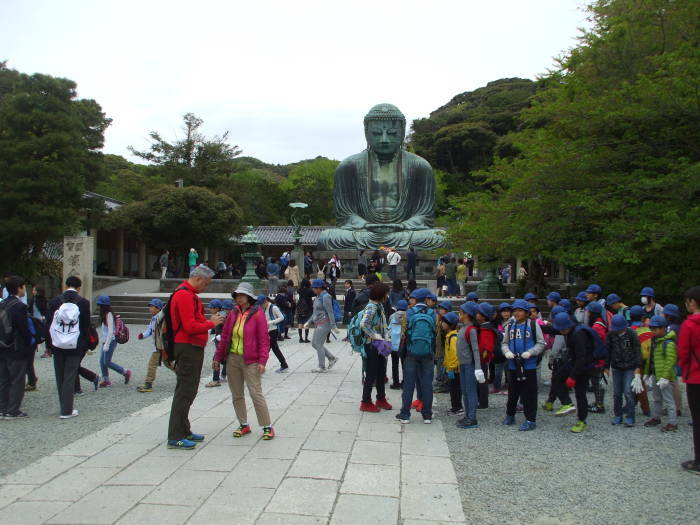 The Daibutsu and the Kōtoku-in temple are a short walk to the west of central Kamakura. 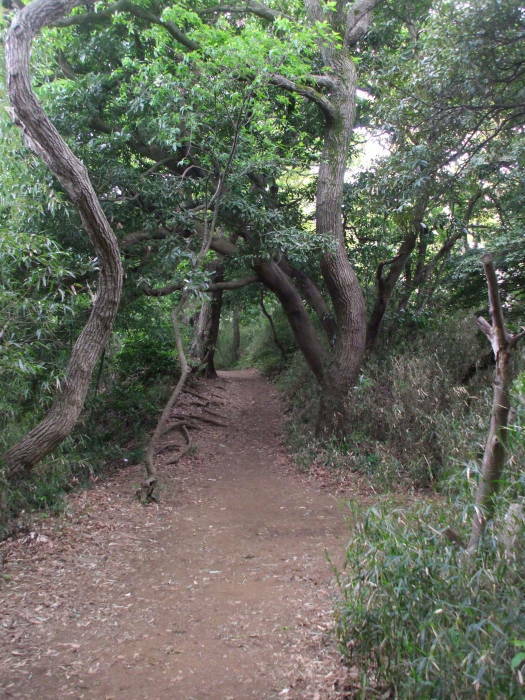 However, I wanted to go there via the walking path. So, I first took the local train from Kamakura to Kita-Kamakura, the next station to the north. I walked a short distance south, past Tōkei-ji, the former nunnery founded in 1285, to Jōchi-ji, the Zen Buddhist temple founded in 1283. 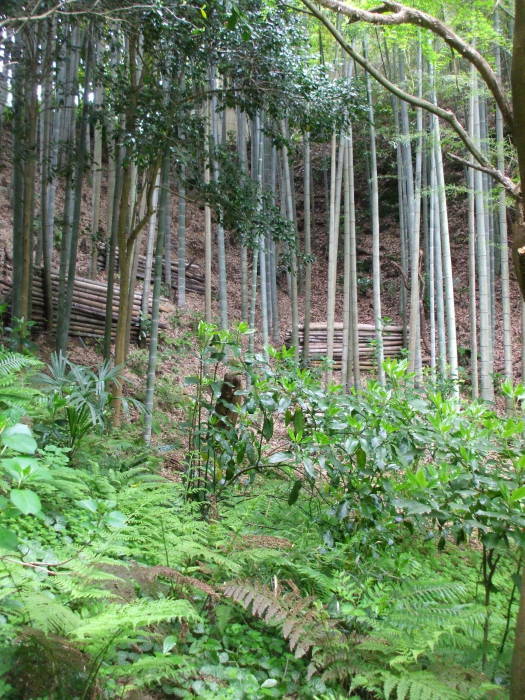 Then I turned off the road, passed Jōchi-ji, and started up the path into the forest. 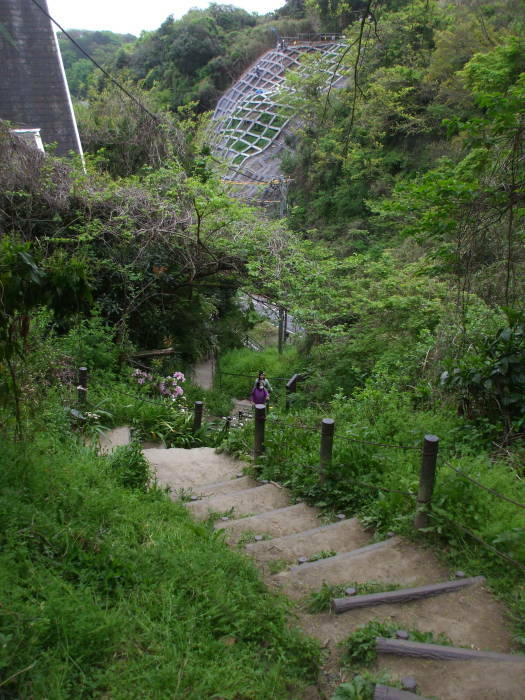 The path follows the ridge surrounding Kamakura. 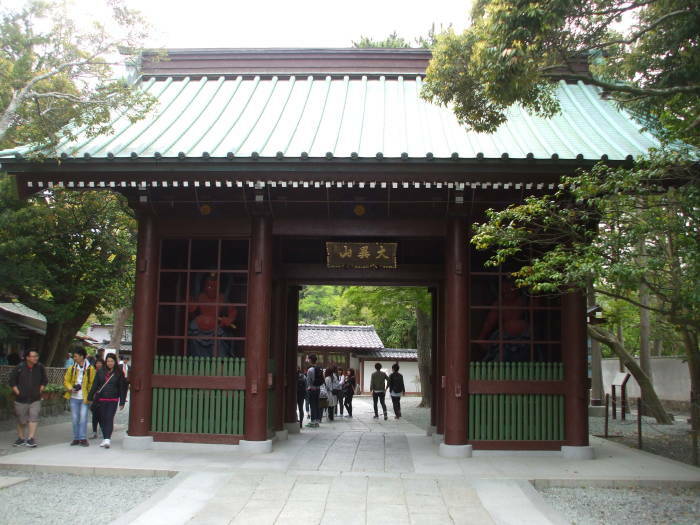 That took me to Kuzuharaoka Shrine, and onward to Kōtoku-in, the temple housing the Great Buddha. 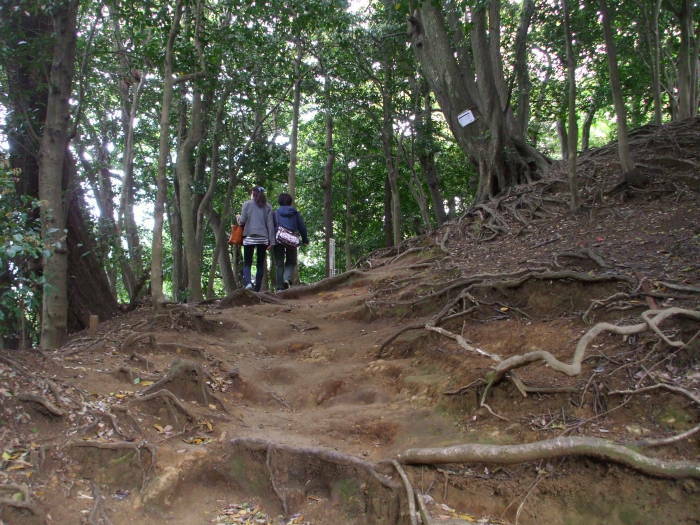 As usual around Kamakura, other people were walking along the path. There were some small memorials along the way. Kuzuharaoka-jinja or the Kuzuharaoka Shrine is about halfway from Tōkei-ji to the Daibutsu. It now has a super-sugary-sweet theme. The Love Shrine theme clashes with its history as the site of a beheading that happened soon before a mass suicide that ended a long civil war. All that happened in the early 1330s, when the Emperor was just a figurehead based in Kyōto. 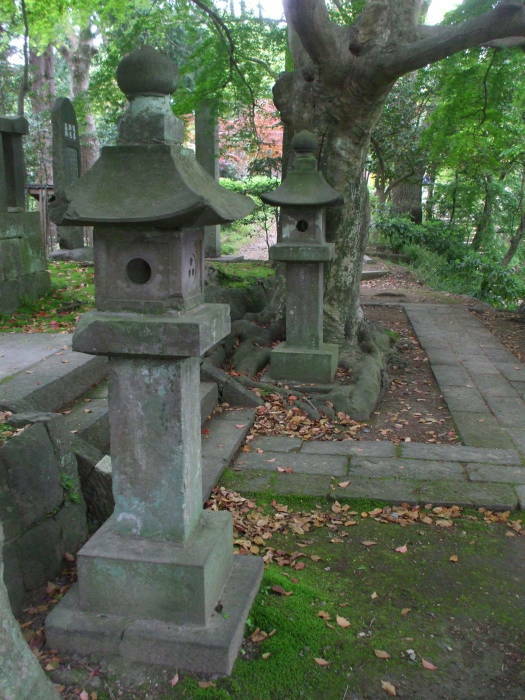 The real power was wielded by the Hōjō clan that controlled the Kamakura Shōgunate. Hino Toshimoto or Hino Shinobu was an aide to Emperor Go-Daigo, whose warriors were fighting to overthrow the Kamakura Shōgun. Hino was captured and then released during the Shōchū Rebellion in 1324. 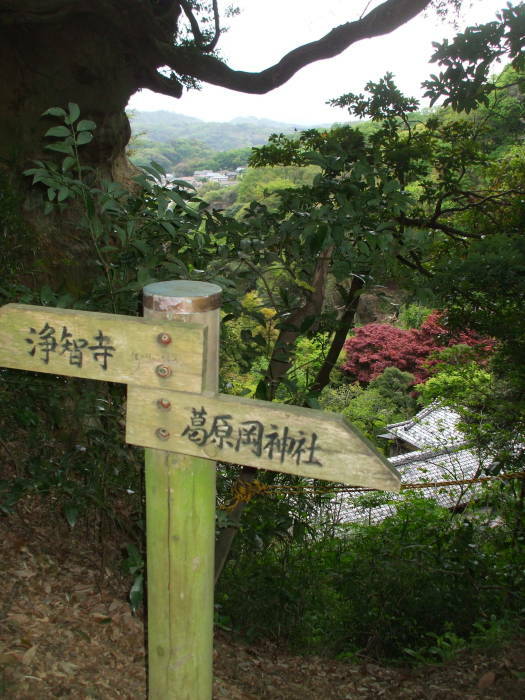 Then he was captured again in 1331 during the Genkō War against the Kamakura Shōgunate. 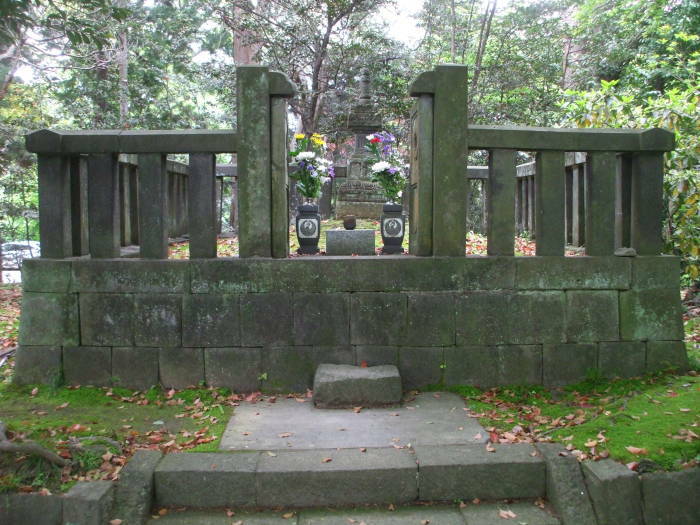 He was sent to Kamakura, where he was executed and buried in June 1332. Just over one year later, in July 1333, the Emperor's forces captured Kamakura. 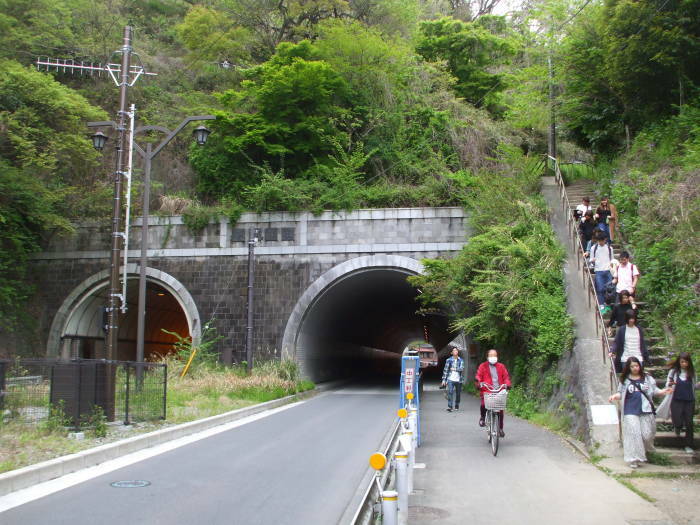 The warlord Nitta Yoshisada was unable to attack Kamakura by land through the passes of the surrounding hills. The legendary version of the story is that he threw his sword into the sea as an offering to the sun goddess Amaterasu, believed to be the ancestor of the Japanese Emperors. The sea parted miraculously, clearing a beach wide enough for Nitta's army to march around the Inamuragasaki cape. Science says that there happened to be an unusually low tide on that date. Either way, the Emperor's forces captured the city. About 900 Hōjō samurai performed seppuku or ritual suicide by disembowelment that day. The invaders sacked the city and burned the temple. Then over 6,000 local citizens followed the example of the Hōjō samurai and also committed suicide. 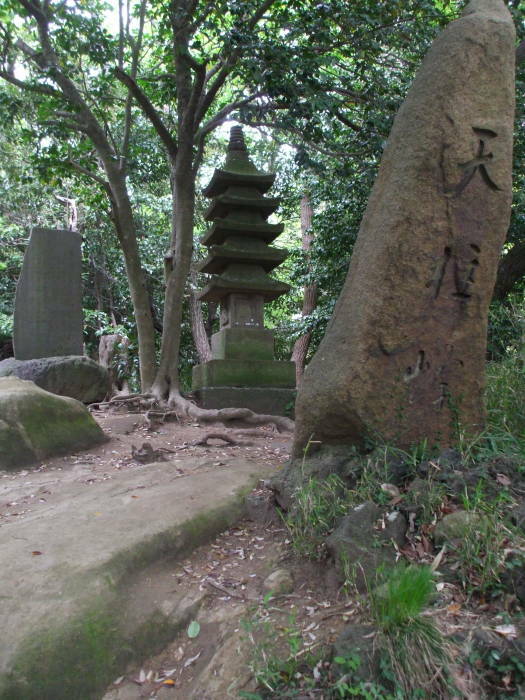 The Kamakura Shōgunate was overthrown, and the Hōjō clan lost power. Emperor Go-Daigo established the Kenmo Restoration and brought the Imperial House in Kyōto back to power. That only lasted for three years. 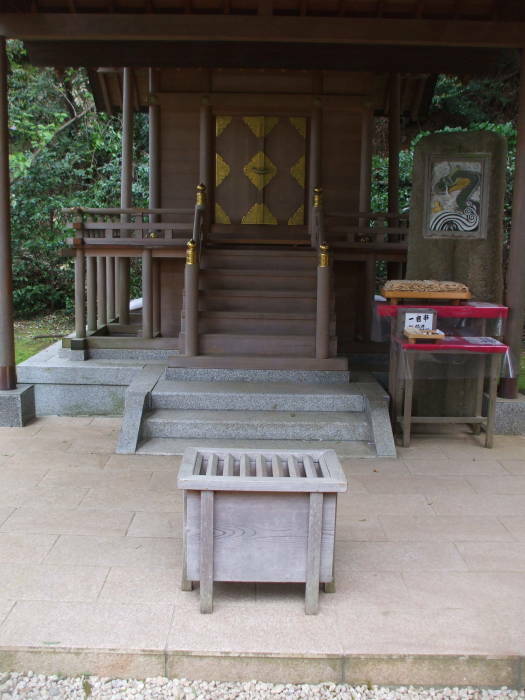 It was overthrown in 1336 by Ashikaga Takauji, leading to the Ashikaga Shōgunate. No other Emperor would hold meaningful power until 1868. Meanwhile the Shōgunate split the Imperial House, installing Go-Daigo's second son as Emperor Kōmyō, the figurehead over the north based in Kyōto. Emperor Go-Daigo was left as figurehead over just the south, based in Yoshino, quite close to Kyōto in Nara Prefecture. Over 500 years later, in 1853, U.S. Navy commander Matthew Perry led the "Black Ships" fleet to Japan. He demanded that Japan open its ports to foreign ships. A series of treaties beginning in 1858 opened Japanese ports first to U.S. ships and then to ships from other nations. Japan had been isolated for centuries, and now the Shōgunate had failed to repel the foreign invaders. Confidence in the Shōgunate dropped. China's recent experience against Britain in the Opium Wars made the national mood even worse. In November 1867 the last Shōgunate was terminated and power returned to the Emperor in January 1868. That was the Meiji Restoration. In 1869 the Emperor moved his court to the Shōgun's city of Edo, now known as Tōkyō. 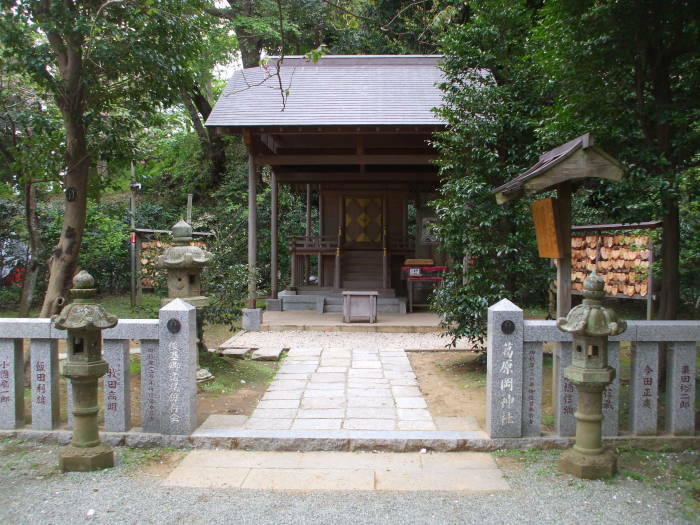 Emperor Meiji established Kuzuharaoka-jinja in 1887 in honor of Hino Toshimoto, the man who had helped the last Emperor who really ruled Japan. 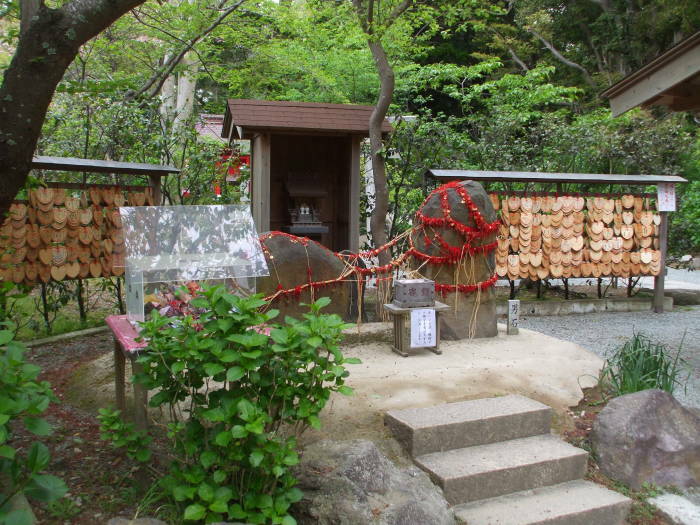 Now Kuzuharaoka-jinja has become the Love Shrine, although it's nowhere near as saccharine as today's kawaii fixation might make it. 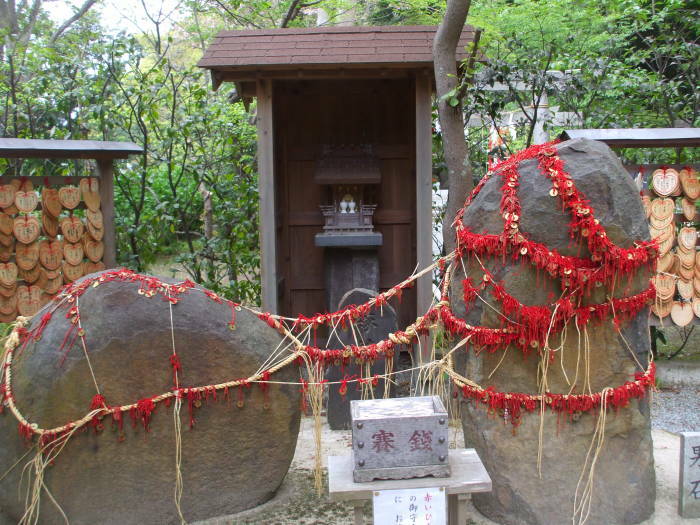 There are two rocks joined by a web of cords and red tassels strung through ¥5 and ¥50 coins. This is a minature version of Meoto Iwa, the "Married Rocks", two rocks just off the shore at Futami. They're connected by a heavy rope that is replaced several times a year in a Shintō ceremony. Here, it's do-your-own. You can buy a heart-shaped ema or devotional plaque, write your prayers or wishes on it, and hang it with the others. 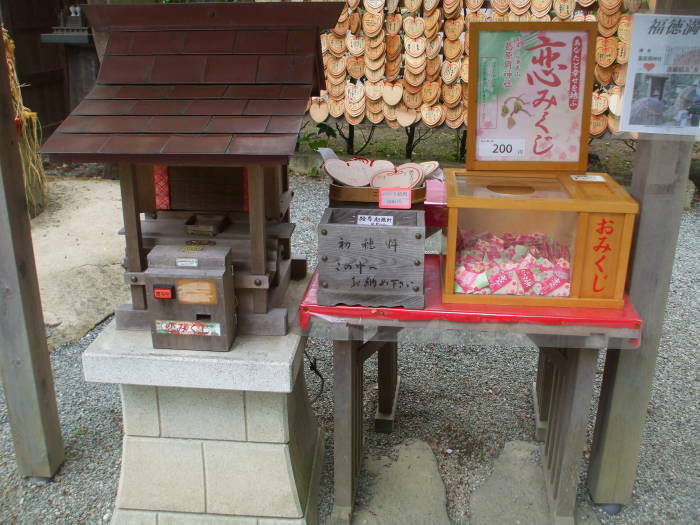 There is also an area where you can buy a small ceramic plate and destroy it by throwing it against a rock. This act of crockery nihilism is thought to get rid of bad influences. 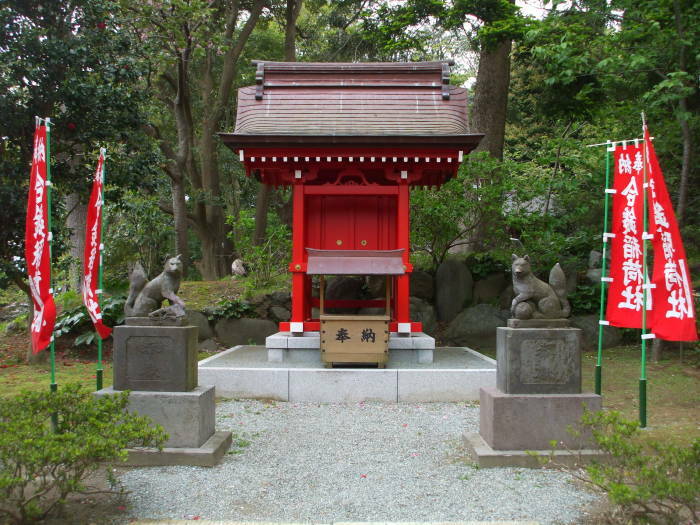 Fox guardian figures are usually found at Shintō shrines. 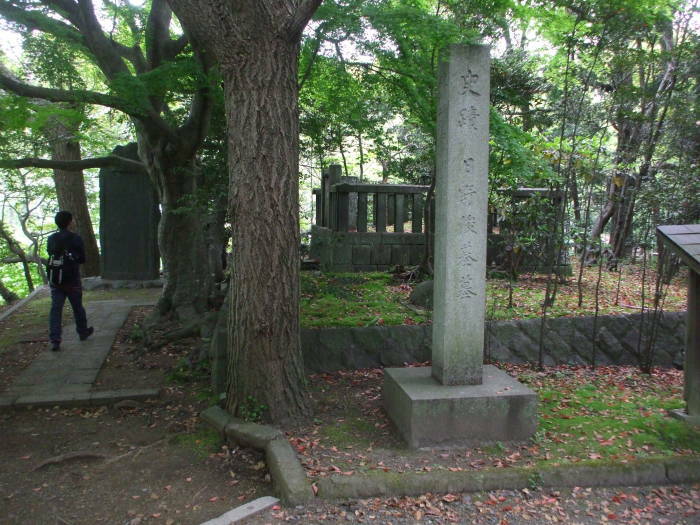 Hino Toshimoto's grave is nearby. 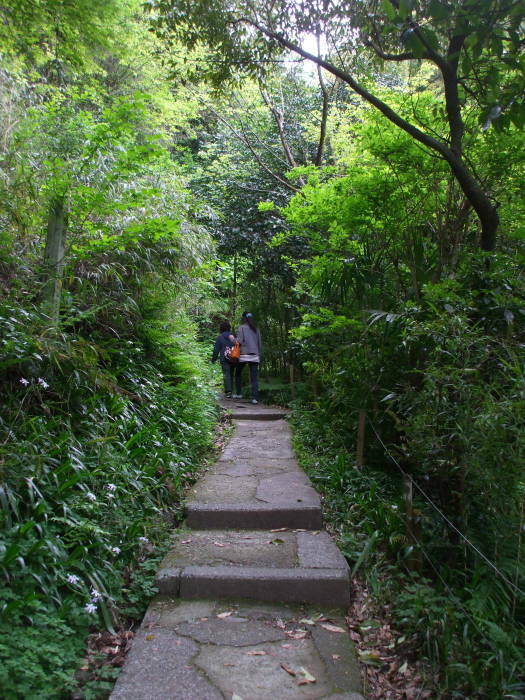 Now let's get back on the way to the Great Buddha. 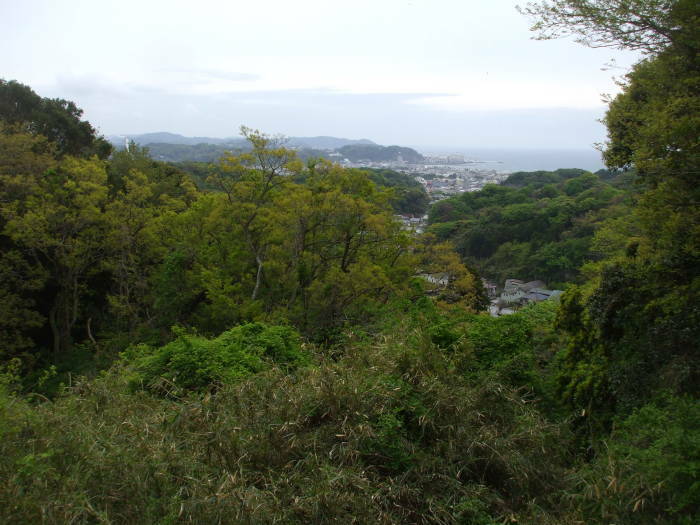 Once in a while there's a view toward the west of Kamakura and the bay. 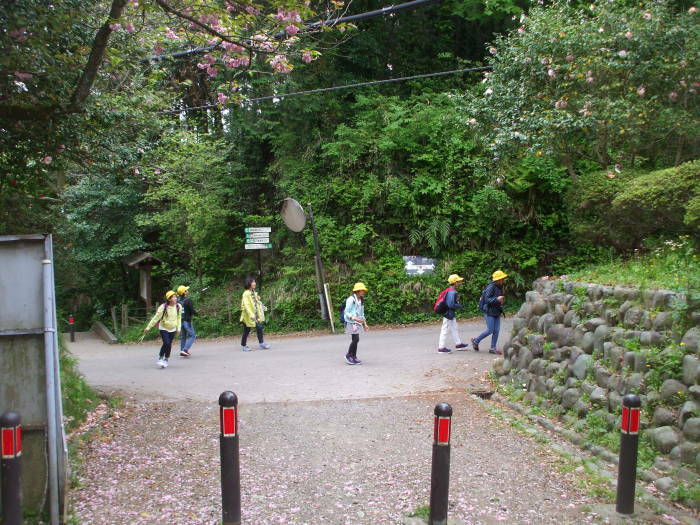 There's a steep descent from the ridgeline down to a road near the temple's entrance. The Chinese Book of Liang recorded in 635 that five Buddhist monks from Gandhāra had visited Japan in 467. Buddhism then officially arrived from China by way of Korea in 552 CE. After several centuries, Buddhism was tangled up in politics. By the early 1100s many people felt that monasteries were corrupt. The monk Hōnen wanted to provide a simple Buddhist practice that the common people could use on their own, moving toward enlightenment even in a corrupt setting. Existing Buddhist practices weren't wrong, but then they weren't practical, either. 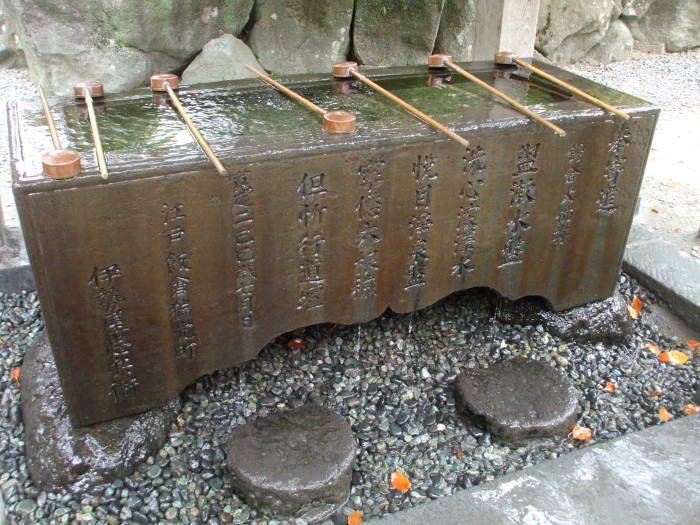 Hōnen founded Jōdo-shū or the "Pure Land School" of Buddhism in 1133. 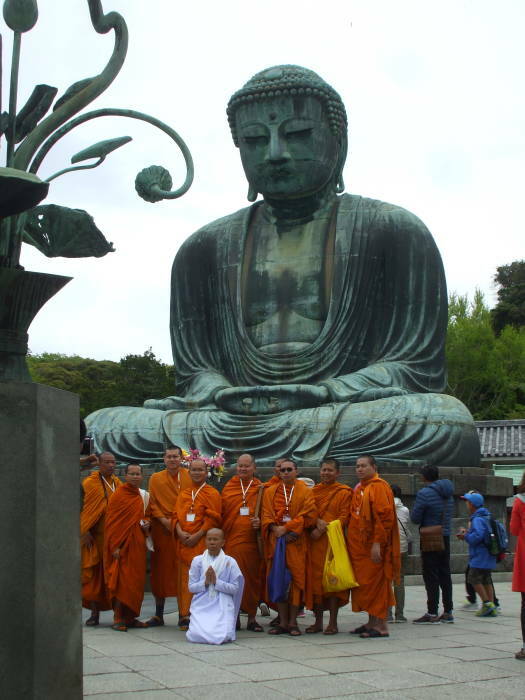 Now Jōdo-shū is the most-practiced branch of Buddhism in Japan. Kōtoku-in, on the west side of Kamakura, is a Jōdo-shū temple. I will buy my ticket and enter the temple complex, passing through a gate that marks the passage into a more sacred space. A notice reads, "Stranger, whosoever thou art and whatsoever be thy creed, when thou enterest this sanctuary remember thou treadest upon ground hallowed by the worship of ages. This is the Temple of Buddha and the gate of the eternal, and should therefore be entered with reverence." 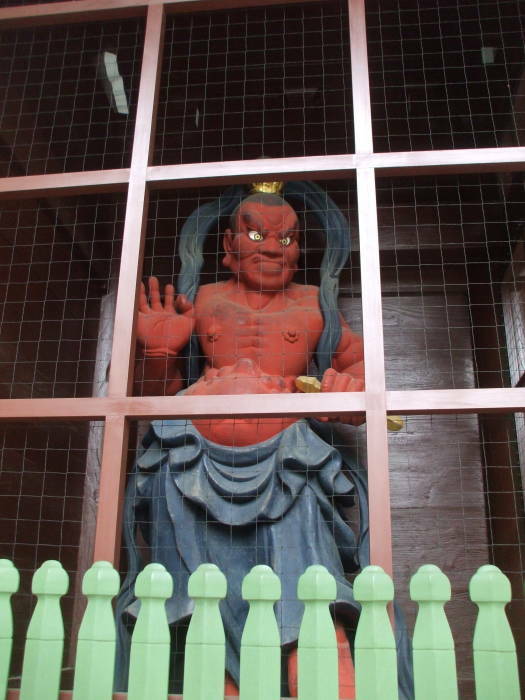 Niō guardian figures, also known as Shukongō-shin, stand in alcoves to either side of the gate. 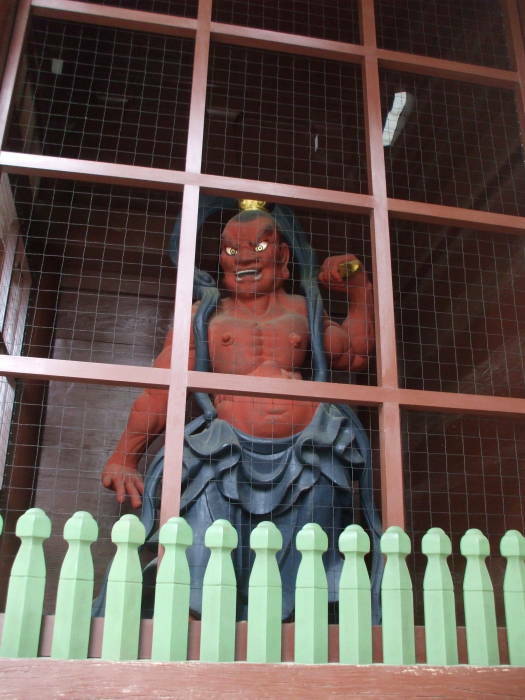 They are Hindu deities who have been incorporated into Buddhism as protectors against evil spirits. One has an open mouth, pronouncing the sound of the Sanskrit letter अ or A, while the other's mouth is closed, pronouncing the sound of the Sanskrit latter म or MA. Together they pronounce the sacred syllable Aum or ॐ. Their appearance is based on the Greek hero Ήρακλῆς, or Herakles. Alexander the Great and his army took Greek culture to the edge of the Indian subcontinent. Greco-Buddhist art used traditional imagery of Herakles to represent Vajrapāṇi, the protector of the Buddha. From there Greek culture dispersed even further, through Central Asia and then China along the Silk Road, and then on to Japan along with Buddhism. 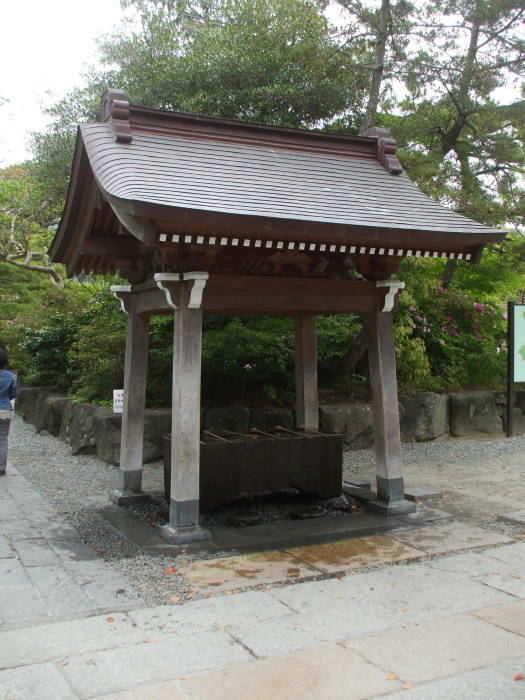 In Buddhism, the shelter or pavilion for cleansing ablutions is called the chozu-yakata. 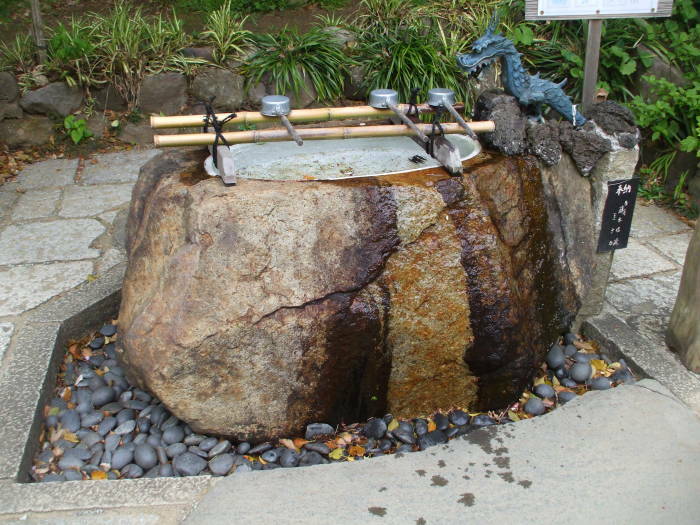 The basin itself is the tsukubai. That term is based on the verb tsukubau, meaning "to bow down", to humble yourself. Wow! That's a big Buddha! According to the temple records, the first giant Buddha statue here was a wooden one, completed in 1243 after ten years of continuous labor. A storm in 1248 damaged the statue and destroyed the hall it was housed in. The bronze statue was finished in 1252 or thereabouts. This is around the time that the "Five Great Mountains" Zen Buddhism temples were being built. The oldest of those, Kenchō-ji, the oldest of those, opened in 1253. The statue is 13.35 meters tall and weighs 121 tonnes. * It was once gilded, traces of gold remain around the ears. It was housed in a hall, which was destroyed by a storm in 1334. The hall was rebuilt, and the replacement was destroyed by a storm in 1369. 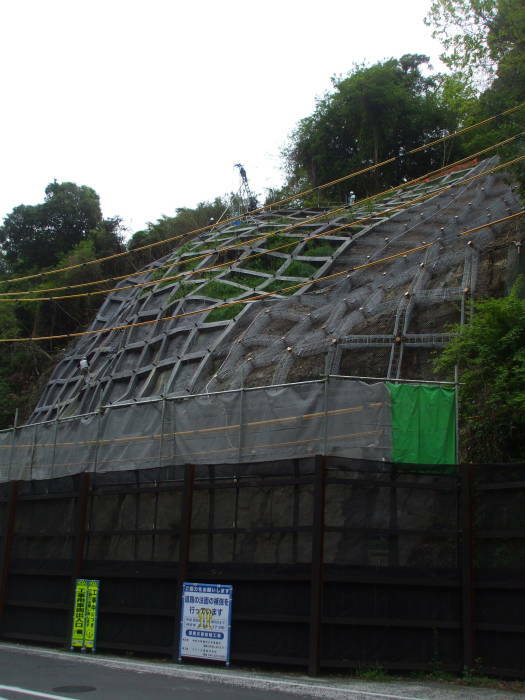 They built another replacement hall, and it was washed away in the tsunami of 20 September 1498. 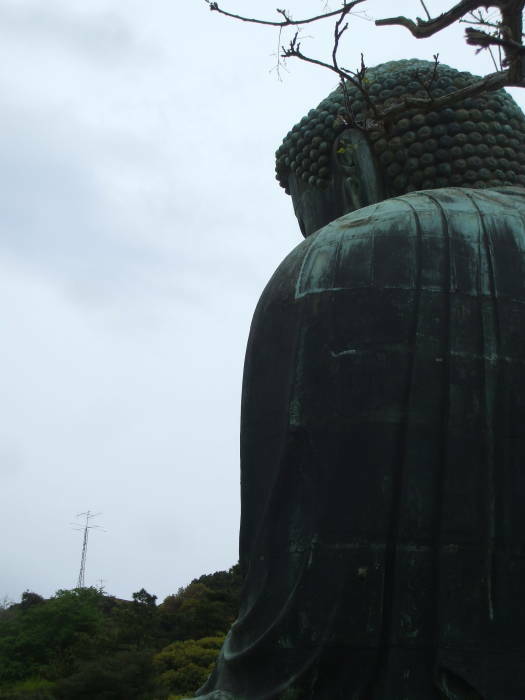 The Buddha hadn't been damaged by the storms or tsunami, it seemed to be weather-proof. So since the 1498 tsunami the Buddha has remained out in the open. 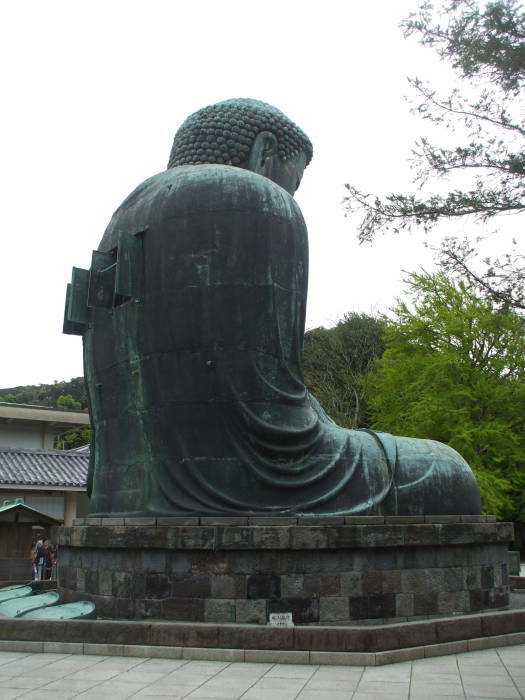 Rudyard Kipling visited Kamakura in 1892, and wrote the poem "Buddha at Kamakura". Verses of that poem preface the initial chapters of his novel Kim, which he finished in 1901. "And there is a Japanese idol at Kamakura." And droned — "Om mane padme hum's"
The Daibutsu represents Amitābha, a celestial Buddha according to Mahāyāna Buddhism, and the principal Buddha in Pure Land Buddhism. Amitābha is Sanskrit for "Infinite Light", so Amitābha is often called "The Buddha of Immeasurable Life and Light". The details are in the Longer Sukhāvatīvyūha Sūtra, the Shorter Sukhāvatīvyūha Sūtra, and the Amitayurdhyana Sūtra. A group of monks arrived soon after I did. 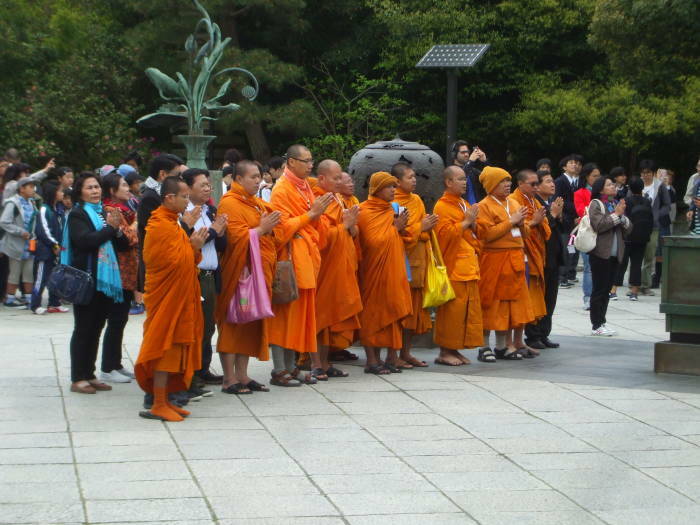 They approached the Daibutsu in stages, praying as they came. 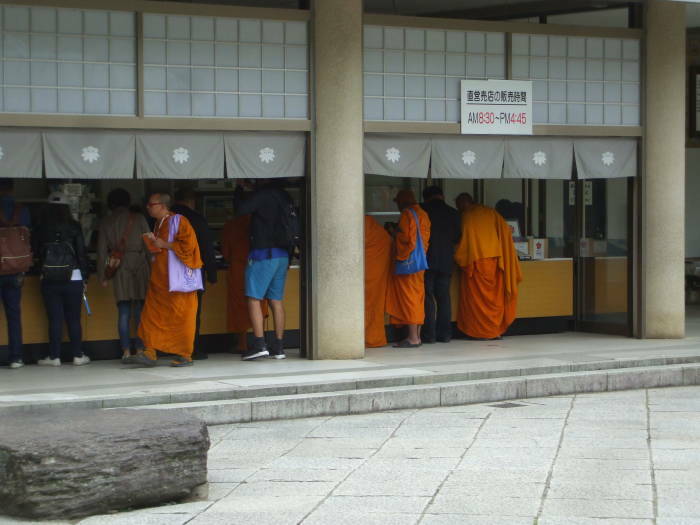 What else do monks do when visiting Daibutsu? Buy some souvenirs and take a picture.